What I am sure of is: I am one of those suckers. The other day I was clearing out a drawer and ran across a family crest certificate that my husband and I had purchased many years ago. Can you hear the Merry-go-Round music yet? It came from a very “proper” looking shop. I believe that it was even spelled “shoppe” ~ a spelling meant to further endorse the authenticity of fake stuff. But we were young and silly and newly married. So we scraped together the $35.00 ( a pretty Royal sum for us 30+ years ago) and bought a “fully researched and authenticated, heirloom quality” piece of paper with our last name slightly misspelled on it. Wow. How cool is That ? What I have learned since ( ironically for free via library books) is that we were totally duped. A crest is only “good” for the original “owner.” A father may have a certain design, but it does not pass down verbatim to his children. When important families married, as was generally the plan, their crests were merged to create a new one for the identity of the newlyweds. Maybe there was an Earl of Momenhousen who bore the crest in my drawer a bazillion years ago. However we, the current-day Momenhousen family, have no claim to it. Heck at this point, I don’t even know what happened to the receipt ! I do have an excuse though…I am an American. Almost all of us are about one inch away from obsession with “the Old Country.” Additionally, we are also generally convinced there is a Demi-Czar, a Baron or at least a Bergermeister in our family pedigree somewhere. The real truth is that Heraldic Design is pretty much about Art. If you are Canadian, you may claim a crest for your lineage if you wish to go through a long and arduous process. For better or for worse,if you are looking for something cool to put up on the wall, its time to do some doodling. Although I did some intensive research on the topic and found a few favorite books that I think are very good for being technically correct, I just recommend the use of an artsy relative. If these all sound too scary, have a sit down with your clan and start brainstorming what it means to be a “Dipfenhoffper” or “Smith.” Think up some words,symbols, and colors to use to represent You. Maybe then craft a family logo~for your ” house”. Remember, siblings should be allowed to represent the same ancestry with their own selection of colors, symbolism and mottoes. Consider using a string of words that spell out your last name as a motto like the poems kids are so fond of writing out of their names . In my post titled “Managing the Help(ers)” I talked a little bit about dividing this task up among different factions of the family. It’s a great way to get everyone started with helping without driving you nuts. And, as a bonus, if you can get everyone to create their own crest, then the cover design for their copy of the finished project will already be done. It’s also as authentic as the “Heraldry” you buy in a glitzy little shop or from one of the online retailers. This is my fabulous furboy, posing as the Lord of a fictitious family who lives out their on-screen lives in a private home rented annually by their production crew. BTW- isn’t it weird to see I did comment on this original post- 847 days ago!!! How did I miss this delightful post? Did you know that my fathers family harkens back to the deFerrier family in 16th c England? They were a long line of barons that ended with someone losing their head. Gulp. No crest for me, thank you very much. I like my noggin attached! Considering the large number of ancestors with crests in my spouse’s family it would be crazy trying to decide which one the sucker company would provide. Maybe one in each room with coordinating colors? We’ve gotten lots of those offers over the years (and, yes, for almost as many of the ancestral lines), we look, laugh and toss. They’re good for a giggle once in awhile. Giggle – no $= Priceless! Haha! I love your Mom! 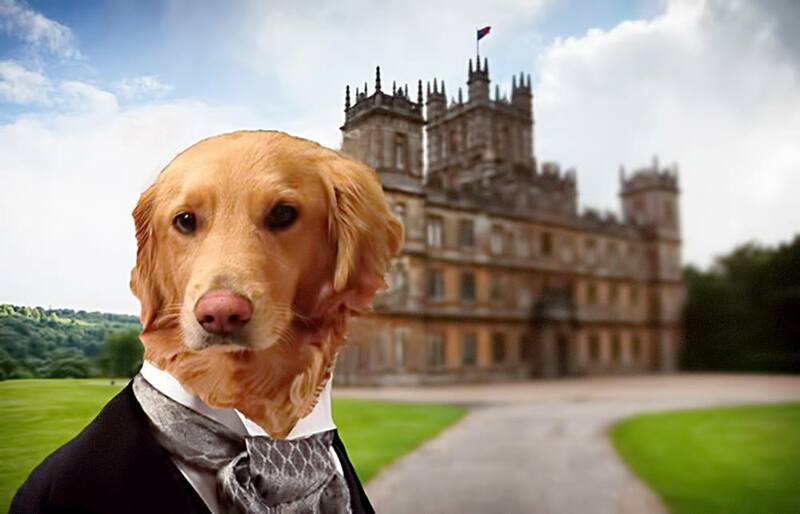 Your furboy is a handsome aristocrat! There are a lot of people who really get into this aspect of genealogy. They usually have little sense of humor. I like all the good, bad, weird, wild, and peasant stuff in my searches. Good to find out the family crest doesn’t pass down. My older brother will be thoroughly disappointed. I believe he bought one. I’ve always been interested in our lineage and crest but the most I’ve spent is for ancestry.com wherein I did find royalty in our history on my mother’s side. Actually my grandmother’s side. A french count. We didn’t even realize we had french in our blood. Very cool. Great post! I’ve never really been interested in family crests. After reading this post, I’m so glad! I didn’t realize that they were specific to one generation/family and weren’t passed down. So funny, what a great post. I hate to think how many people have all been suckered by “Ye Olde Heraldry Shoppe”. I’m always amazed at how often surnames changed – even my grandfather was born Henry Blair and died Henry Blaine. Makes this process tricky at best! That’s funny. My father’s side of the family farther back laid claim to the Blackford (my maiden name) castle outside Edinburgh, Scotland. I wonder if they might let us have it. LOL. Would be cool to visit it though. I can remember getting advertisements in the mail for family crests years ago. I always thought they looked cool–but am glad now that I never bought one. I didn’t know that about it not passing down. Interesting!